The Georgian Republic Flag is white and features a large red cross in the center of it, which meets all the edges and divides the flag into quarters. In each quarter of the cross, there is a red "Bolnur-Katskhuri" cross. The five crosses of the flag are symbolic of Christianity and the sacrifices made and the white color symbolizes peace and love. The Georgian flag was adopted on January 25th, 2004, which makes it one of the newer flags in the world and it is also known as the "Five cross Flag." The Georgian Republic flag that is used today, was first used by the Georgian patriotic movement following their independence in 1991 from the Soviet Union. In 1999, Parliament wanted to make it the official country flag, but it was not approved by the President at the time, Eduard Shevardnadze. 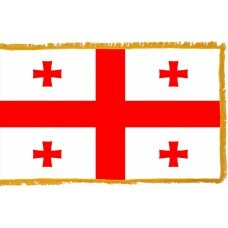 The flag being used during this period was a tricolor flag that was also used between 1918-1921 when Georgia was an independent country for a short amount of time. When it became part of the Soviet Union, the flag was abolished. 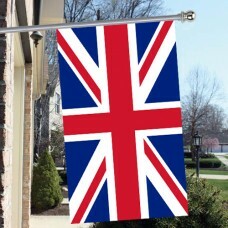 The people of Georgia did not want the same flag that was associated with such a bleak and violent time in their history. 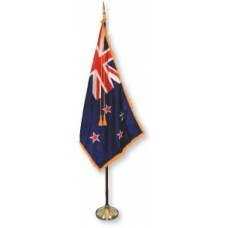 The current flag was finally adopted in 2004 by Mikheil Saakashvili after he was elected as President. Between 1811-1918, Georgia was under the rule of the Tsar of Russia. In 1918-1921, it finally became independent until the Russian civil war, when the red army advanced first into Georgia and on February 25th, they entered the capital, Tbilisi and established a government of workers and peasants. This was the beginning of Georgia becoming part of the Soviet Union. In 1941, when the Germans invaded the Soviet Union, they didn't manage to reach Georgia, however 700,000 Georgians had to fight in the red army, resulting in approximately 350,000 of them losing their lives. 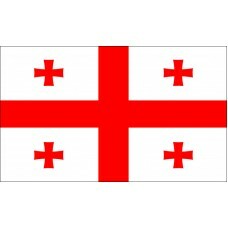 Georgia is a country in the Caucasus, on the Black Sea. It is bordered by Turkey, Russia, and Azerbaijan. Georgia is referred to as a transcontinental country as part of the country is in Eastern Europe and part of it is in Southwest Asia. The capital of Georgia is called Tbilisi and was founded in the 4th Century. Georgia (which is known as Sakartvelo by the natives), is home to two ancient cities, discovered 3,000 years ago, called "Mtskheta" and "Kutaisi." It is also home to the world's deepest cave "Krubera Cave," which is 7,200 ft. deep and would take a caver 27 days to reach the bottom of it. Georgia is attracting more and more tourists each year due to its popular ski resort, Gudauri and due to all the interesting historical and ancient sites that are within the country, such as the "Holy Trinity Cathedral" (the 3rd tallest Orthodox Cathedral in the world), "Uplistsikhe," which is a rock-hewn town that dates back 3,000 years and the "Narikala Fortress" which is also referred to as the "Mother Fortress of Tbilisi" that was established in the 4th Century.